“Chaplaincy is sitting with the most unfathomable and unimaginable times in other’s lives and holding all as sacred space, place and time.” The ordination of Lex Cade-White this afternoon was a spirit-filled service with calling of ancestors, mixing of the sands of her life, laying on of hands, reflective and joyous singing, and sharing of Communion. Reverend Cade-White will serve the church as Pastor of Hospice Ministries through her work as a hospice chaplain. The special service included the Conference Minister of the Southeast Conference of the UCC, Rev. 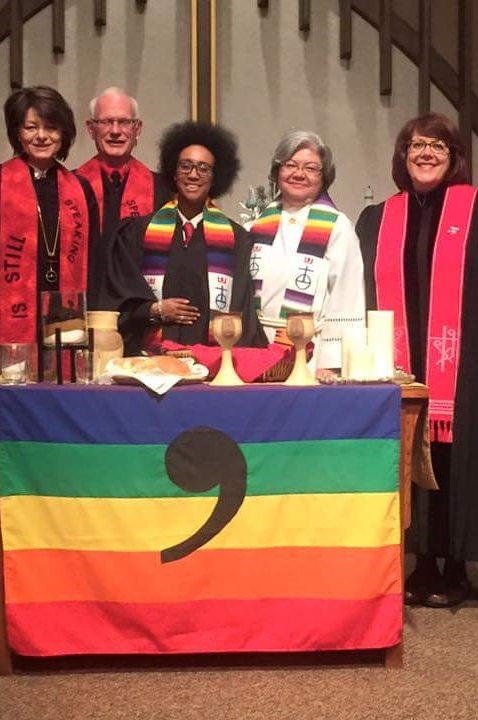 June Boutwell, representing the ordaining body, and the Associate Conference Minister, Rev. Jane Anderson, of the UCC Wisconsin Conference performing the installation.